Pensacola State College’s Theta Chi chapter of the Phi Theta Kappa Honor Society has created a pollinator-friendly garden in courtyard of Building 17 on the Pensacola campus. Faculty, staff and students are encouraged to visit the garden which the students designed and built as part of their research. 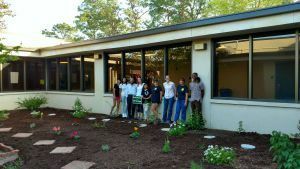 The students learned how to create a pollinator garden free of pesticides that can damage the environment. Several fundraisers were held during the fall and spring terms to purchase plants from ARC Nursery and create stepping stones for the garden, said Jessica Petersen, PTK co-adviser. “The most recent planting took place early in April, and the garden has been spruced up and is ready for spring visitors,” she added. The students plan to continue to improve the garden and hope to make signs that identify each pollinator-friendly plant. “We’re hoping other students, the faculty and staff all take some time for reflection when they visit the garden,” Petersen said.